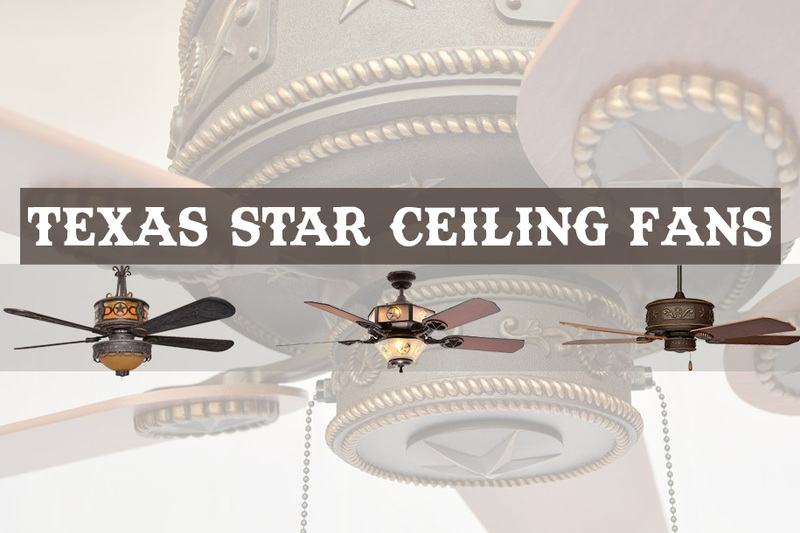 A Texas Star ceiling fan is the perfect statement piece for those decorating their own rustic cowboys hideaway or putting the finishing touches to a Western inspired home. Ceiling fans sporting the Texas star are the perfect blend of rustic charm and classic Texan style. Although ceiling fans aren’t the first thing we think of when decorating a space, it’s often times a necessary staple. These ceiling fans are meant to match any Lone Star inspired room and allow you to transform something as ordinary as a ceiling fan into an eye-catching staple. When researching the best Texas star ceiling fans, one brand that caught our eye was Copper Canyon. This brand offers an amazing variety of rustic ceiling fans with western, cowboy and Lone Star themes. Each Copper Canyon ceiling fan features beautiful handcrafted elements and unique attention to detail that is often lacking in many modern ceiling fans. Copper Canyon offers a beautifully crafted western inspired ceiling fan with their Sheridan model. This ceiling fan features many intricate handcrafted elements that are sure to turn some heads. The Lone Star motif runs throughout every piece of this ceiling fan from a subtle rope design in the light kit to Texas stars carved into the antique walnut fan blades. This fan features a beautiful Amber Mica liner that allows the metal panels to showcase stunning hand painted silhouettes in the motor casing. The Copper Canyon Sheridan can be installed with or without the included light kit. The Copper Canyon Western Star is a stunningly designed ceiling fan that features the Texas Star in everything from it’s motor housing to it’s fan blade hardware. The motor housing and hardware is hand painted in soft bronze with antiqued gold highlights. Traditional Lone Star accents are carved throughout the metal body of the ceiling fan for a special western touch. The natural wood blades are hand carved and are a luxurious addition compared to the cheap ABS blades found in other ceiling fan brands. Like all Copper Canyon Texas star ceiling fans, you will admire the craftsmanship involved in bringing these fans to life. In addition to the indoor model, there is an outdoor option you can choose for covered decks and patios. Copper Canyon offers a hugger ceiling fan options for spaces with low ceilings. 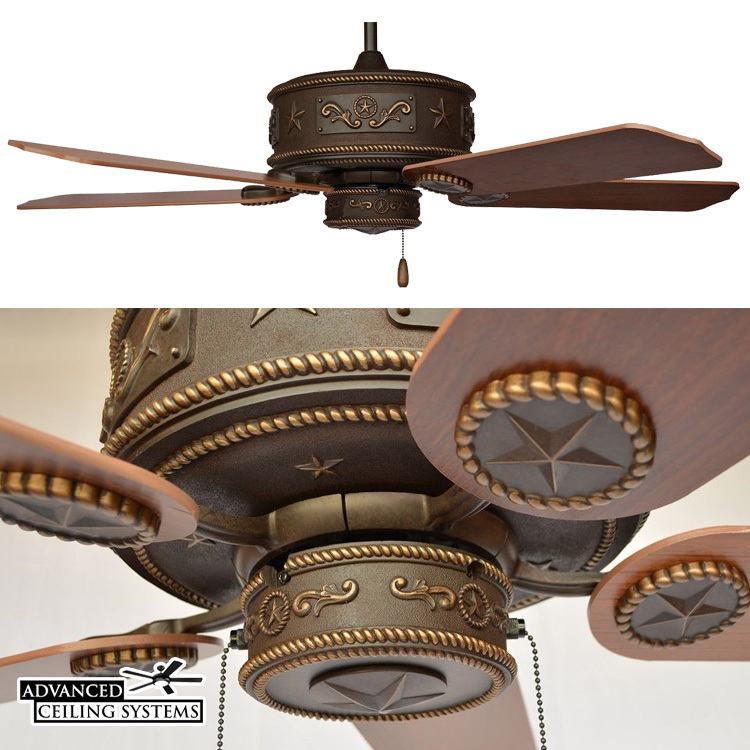 This ceiling fan offers a traditional westerns style throughout with a hand painted motor housing in a soft bronze. The metal housing features a Rodeo Bronco Rider motif painted in antique gold while the included light kit features a matching Texas star relief. Anyone looking for an authentic homage to the Old West will love the intricate details in the Cheyenne ceiling fan. The blades feature horseshoe medallion hardware and even the light kit cover offers beautifully handcrafted relief that matches the ceiling fan’s overall motif. Every element of this ceiling fan is a piece of art thanks to Copper Canyon’s great attention to detail. Other brands also offer some great Lone Star ceiling fan options with their simple designs and western motifs. Quorum and Hampton Bay are ceiling fan brands that can be found both at big box stores and online. Here are our favorite Texas star ceilings fans from each brand. Quorum offers a simpler Texas star ceiling fan that incorporates more modern elements into an otherwise western inspired design. The Texas star adornments on the motor housing and fan blade medallions are understated for a clean cut look. The fan blades are reversible with both Toasted Sienna and Walnut finishes to choose from. The Quorum Lone Star ceiling fan is the only ceiling fan on our list that is not pull chain controlled. Instead a wall control unit is included with each ceiling fan for easy control even if you have higher ceilings. Hampton Bay has introduced their own Texas star ceiling fan with the Lone Star Ceiling Fan model. This fan features an incorporated frosted glass light kit that features lone star etchings throughout. The Lone Star ceiling fan includes five distressed oak finish blades that matches nicely to it’s aged copper housing and accents. The light bowl on the bottom adds adequate illumination to medium sized rooms while the lighted portion of the motor housing provides a unique touch mood lighting. Out of the box this ceiling fan is pull chain operated. But it is remote control adaptable with the purchase of a Hampton Bay remote.